So, you’ve got an interview lined up, whether it be for print or screen, and you want to brush up on the best way to answer a journalist’s questions. 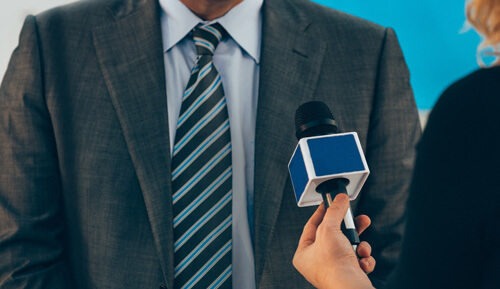 Read these top 10 media interview tips to learn what to do and what to avoid while giving a media interview. 1. Get your key messages in early and often. Get your key messages to stick by stating them early in the interview and continuing to return to them throughout. Finding ways to repeat the core messaging you want to get through in the interview helps ensure that it ends up in the piece the reporter is writing. 2. Support your messages with proof points, facts, metaphors. Although this may seem obvious, it is more critical than ever to cite facts and keep your message clear. In these days of fake news and skepticism, an easily understandable message backed by facts will build you and your company’s credibility. 3. Have an opinion and point of view on issues/trends. The best way to insert yourself into the news is to have an opinion on the day’s stories as well as ongoing topics and trends. Reporters need to write about these topics and if you can be a reliable source timely issues, they are more likely to come to you for commentary. 4. Use bridging to pivot out of tough or off-target questions. Bridging is the art of answering a tough or off-target question, and segueing smoothly to your key message points. The secret to successful bridging is answering the question. Whenever you’re asked a question, give a short, honest answer, then bridge to a positive key message you’ve prepared in advance. 5. It’s OK to say “I don’t know” or ask to restate the question. If a reporter asks a question that you don’t know the answer to, it’s okay to tell them so. This will come off with you looking better than trying to answer a question that you clearly don’t have expertise on. Another good trick is to refer them to someone else in your company who can answer that for them and offer to make that connection. 1. Never lie or dodge tough questions. During media interviews, you may be asked the same tough question a number of different ways. If you’re pushed to provide more detail or asked a question you don’t want to address, it’s important that you stick to your guns and stay on message. This is where bridging comes into play. Give a short and honest answer then bridge to a positive key message you’ve prepared in advance. Journalists are frequently looking for soundbites so keep your responses simple and to the point. Remember that print and online journalists are restricted by word count, so answers that are too long may never make it in their story, get cut by an editor, or shortened for length and taken out of context. You’ll increase your likelihood of being quoted when you offer a direct response that is only a few sentences in length. 3. Don’t bad mouth the competition. This is something that people are often tempted to do when asked about their competition but it’s not a good look for your company, and should be avoided. It puts you in a bad light AND gives free press to your competition. Simply speak an excellent interview where you discuss your organization will serve you better. 4. Don’t talk “Off the Record” or get too comfortable. We often warn clients not to get too comfortable during interviews with the media. Talking off the record is a nice concept to build relationships with reporters, but it’s risky. There’s always the chance the reporter won’t honor the request, or will just find another source to corroborate what you told them. Always assume everything you say is going to be published and act accordingly. 5. Don’t assume the interview is over until it’s really over. A tried-and-true interview tactic to get more information: if a reporter gives a verbal or physical cue that signals the interview is over, don’t assume the interview is finished. At this point, your guard is likely down and this is a great opportunity for them to ask a hard hitting question they’ve been waiting to ask. Don’t ever assume the interview is over until you’ve hung up or walked away from the meeting. Follow these top 10 media interview tips and you’ll be ready for your next interview. For tips tailored to you and your business, contact a professional with media experience for personalized coaching. 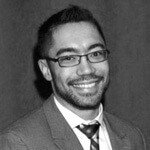 Travis DeLingua is a digital communications professional with a strong background in digital media and adtech. He works with his clients to build integrated communications strategies that generate ROI and help businesses meet their goals. 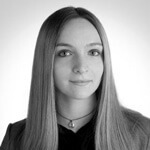 Caroline Yodice is a Senior Account Executive in New York specializing in digital media and adtech.